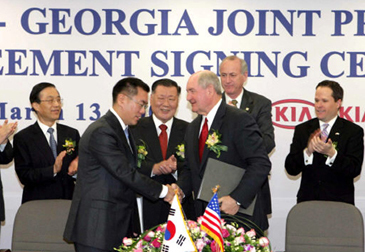 Are State Leaders Worried About Kia Delay? April 26th was marked on the calendar as a day of celebration. But the gathering has been delayed and many are asking why. Ironically, this comes in the midst of a bribery probe in South Korea and Kia's top official has been banned from leaving the country. Shovels were scheduled to hit the ground April 26, 2006. Then Kia leaders called it off. Bert Brantley, a Spokesman for the Dept. of Economic Development says, "when they told us, asked us to reschedule, we asked them if there was an impact on the project ... that's our main concern, bringing the plant to west Georgia and when they told us it was internal, and it had nothing to do with out plant, we were satisfied." Satisfied, maybe, but not clear about exactly what's going on in South Korea. Reports indicate a huge investigation into possible slush funds raised by the company. Meantime, Kia's president has been barred from leaving the country. Brantley says, "there are a lot of unknowns about what's going on, we don't even know the full story about what's happening over there." Georgia Gov. Sonny Perdue is convinced the groundbreaking delay won't affect the plant itself. "absolutely not." Perdue insists the groundbreaking is simply a media event, a celebration and is sure the delay won't at all affect the project. "The contract is still signed, work is going on at the property, property is being acquired, engineering is being done, so I wouldn't read anymore into that than it's just a date change," Perdue says. Brantley adds, "they want to build cars in America, they want to build cars in Georgia, they want to build cars in West Point, and their committed to the project, the state is committed and we're moving forward to getting the plant located there."